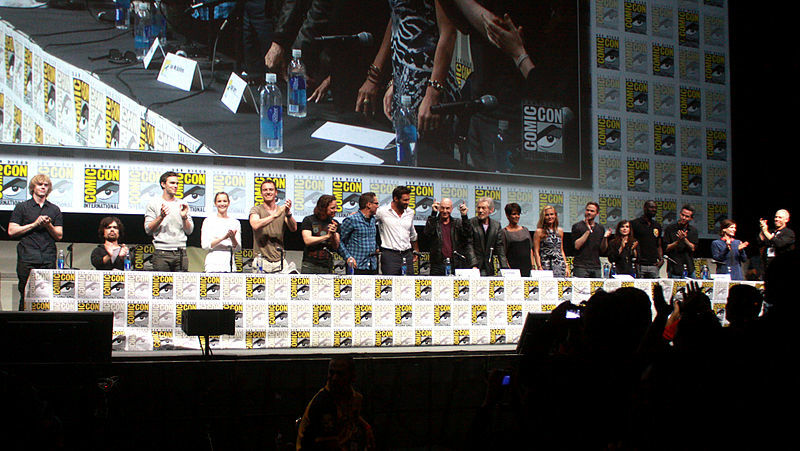 The cast of X-Men: Days of Future Past at the 2013 San Diego Comic Con International in San Diego, California. There are movies that exceed all expectations, that power through stereotypes, that gain recognition for cinematic excellence… “X-men: Days of Future Past” is one of the best. Following the film Wolverine, released in 2013, Days of Future Past is forced to avenge the terrible reviews of its predecessor, which it does brilliantly. The film possessed a phenomenal cast including “American Horror Story’s” Evan Peters as Quicksilver and Ellen Page as Kitty. The cast expertly portrayed their assigned roles and executed proficient acting. James McAvoy showed the depth of pain and emotion as easily as he showed the wit and snark of young Professor X. The plot is perhaps the greatest part of the film. The future is a dark, miserable place for mutants and their human allies. There are giant robots known as Sentinels that wage war on the mutants with the help of the DNA of Mystique, another mutant (played by Jennifer Lawrence). The wolverine (Hugh Jackman) is then sent back in time to prevent the authorities from seizing Mystique’s DNA in the first place. The film also introduces the Vietnam War into the narrative which is nice because it continues the theme of wars within the backdrop of previous films. With time travel, cameos, and great editing, “X-Men: Days of Future Past” excels as the series’ fifth sequel.